This June, Rockstars Volume 1: Nativity in Blacklight will release. This new trade paperback is the first collection (issues 1-5) of the Rockstars comic series by writer Joe Harris (Snowfall, X-Files) and artist Megan Hutchison (An Aurora Grimeon Story: Will O’ the Wisp). The story: When a pattern of unsolved groupie murders from the 1970s resumes in present-day Los Angeles, nobody makes the connection except Jackie Mayer, a rock nerd with a strange connection to music’s urban legends and a mysterious ability to “see” what most people miss. Together with a muckraking music writer named Dorothy Buell and his loyal cat Skydog, Jackie uncovers an underground conspiracy involving a legendary band, demonic possession, and sacrifices to the dark gods of rock. 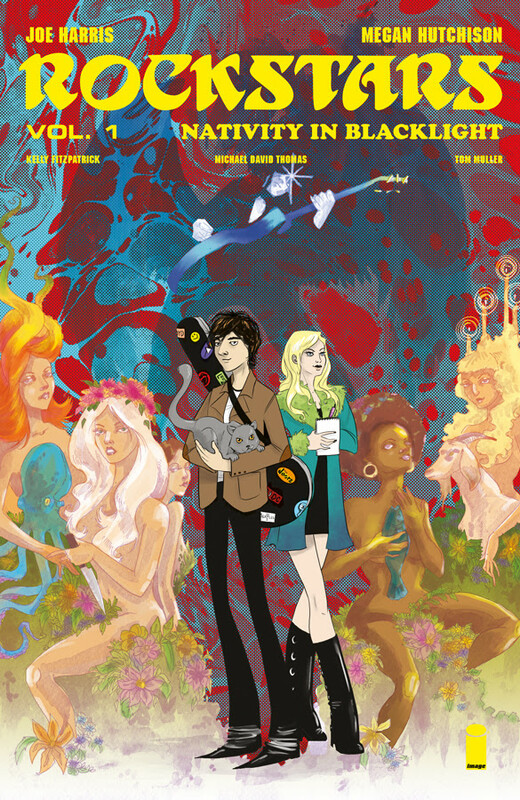 Rockstars Volume 1: Nativity in Blacklight (ISBN: 978-1-5343-0190-0) hits comic book stores on Wednesday, June 14th and bookstores Tuesday, June 20th.